The Astro-Physics Command Center (APCC) provides advanced mount control features useful for local or remote operation of your Astro-Physics GTO mount. It was developed by Ray Gralak, the author of PulseGuide and PEMPro in collaboration with Astro-Physics. Whether you are controlling your mount while seated at your computer six feet or half a world away, there are functions to provide you with a more productive and pleasurable experience. Comet or satellite trackers will love the custom rates and 3600GTO owners with limit switches and/or precision encoder will appreciate the user interface. Through the application of virtual serial ports, APCC will act as a hub for a number of other applications that can all communicate with the mount through a single COM port. APCC provides useful safeguards even if you are operating your scope in your backyard. APCC is offered in two versions: APCC Standard (APCC-ST) and APCC Pro (APCC-PRO). We also offer an upgrade option from Standard to Pro Version (APCC-UP) whenever you wish to use the additional features. Each license includes one year free software subscription that entitles you to download the latest new features, enhancements or bug fixes. After one year from date of purchase, you will have the opportunity to continue your subscription for approximately 20% of the product retail price. Renewal is optional, the software will continue to operate whether you renew or not. ** Although APCC was released in October 2014, we have not implemented the subscription renewal plan for any users to date. ** However, we reserve the right to so do in the future. You may install up to two copies of the licensed software, provided that only one (1) copy is in use at any given time (i.e., no concurrent use on different computers). If you require additional licenses for your personal use, please purchase additional APCC-ST-A or APCC-PRO-A licenses, for use by the same person. If you have different requirements, please contact Astro-Physics. Please refer to our license agreement. All of the features of APCC Standard (see list below). Dual-model pointing and tracking rate correction even with the telescope in the counterweight UP position. Supports THUM temperature reading sensors. Includes a separate application to acquire Pointing/Tracking model data (APPM). Refer to the Version History for additional information. PinPoint Astrometric Engine. Please go to the following website to download the 60- day trial version or make your purchase: http://pinpoint.dc3.com. 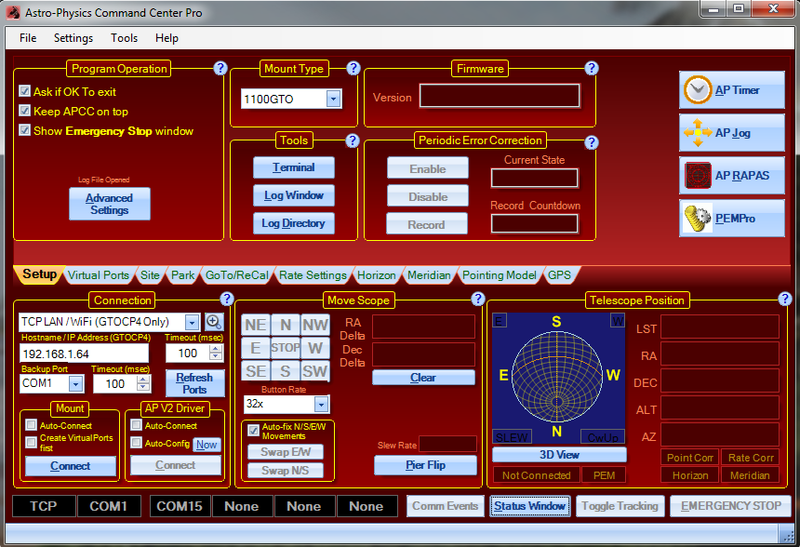 PinPoint is Included with ACP Observatory Control software by Bob Denny and available from DC-3 Dreams . Safety countdown timer to protect from COM loss. Can use two connection options so one serves as a safety backup in case of network failure or failure of primary connection. Define two Virtual Port for the ASCOM driver to accommodate programs that are run as administrator and those that are not. Added software home and limits function for all GTO mounts. Note: To avoid errors, this tab will not appear if the mount has absolute encoders, which has its own separate hardware/software solution. 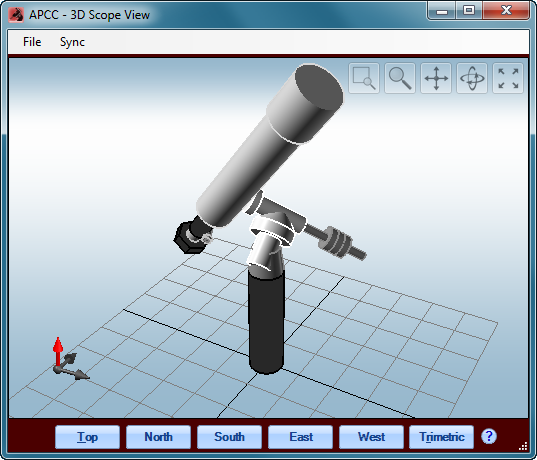 Editable 3D telescope view shows the current orientation of your telescope and mount. Editable horizon tracking limits to stop tracking or park the mount once a horizon limit is reached. Editable meridian tracking limits to protect your telescope from pier collisions. Slew to counterweight-up positions with dynamic meridian delay feature (tied to meridian tracking limits). Multiple virtual ports to allow easy connection of applications that do not require ASCOM support (like PulseGuide or TheSky6/X). Site management allows easily changeable setup for multiple sites. Display and change time zone settings. Support for reading latitude/longitude/elevation from third-party GPS devices. Most standard GPS units that create a virtual COM port on a computer should work. GoTo or sync on RA/Dec and Alt/Az coordinates. Enter catalog J2000 coordinates and convert to topocentric JNow and vice versa. Convert RA / Dec coordinates to Alt / Az coordinates and vice versa. Access to backlash, reticle, focus and PEM settings. Set custom RA/Dec tracking rates. Can save/recall multiple RA/Dec and Alt/Az slew coordinates. Park to editable Alt/AZ positions. Easy to read status window summarizes mount status of critical parameters. Logging of all commands for debugging if a problem occurs. Convenient log zipper to bundle relevant log files should problems occur and you need support from AP's world-class support team! Terminal Interface tool to send commands directly to the mount. All features of the latest GTOCP3 control box firmware are supported allowing feedback of the actual status of the mount at all times. Full support for the latest GTOCP4 features and capabilities inclluding connection via Ethernet or WiFi. Tight integration with the ASCOM driver. Advanced support features for 3600GTO/3600GTOPE for precision encoder and limit switch functions. Added four new application buttons (ApTimer, ApJog, ApRAPAS, PEMPro) to the Main Screen. They will only be visible if the corresponding application is installed. Quick access to the Help files that relate to the function that you are attempting to use. Note the help icons on the screenshots below. Horizons allows your Astro-Physics mount to accurately follow solar system objects such as Comets, Asteroids, Planets, and even the moon and sun. It uses data that you import from the JPL Horizons Ephemerides web site to calculate the precise tracking rates needed to follow a target without any guiding. This means you can do longer unguided exposures of a comet without it blurring. Or, in the case of fast moving asteroids, you don't need to worry about keeping your scope centered because Horizons will do that for you. Here are a couple of screenshots to give you an idea of the interface. This is the Main Window of the APCC Pro Version. The Setup Tab is visible and various other tabs, the 3D View or Status Window can be easily selected. The telescope position values continually update and the graphic plots the position of your telescope and indicates the pier side. Move commands are readily available as is the status bar on the lower portion of the window. Connection information is always visible. Note that you can set up a backup COM port that will be available if you experience connection problems with your primary port. The circular help buttons direct you to the specific part of the manual that discusses the function of the group box - a very handy and useful feature!. 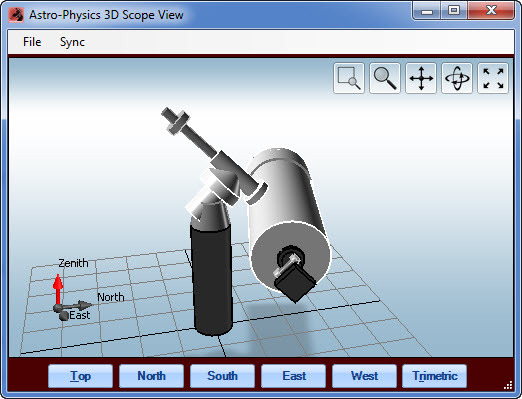 The 3D scope view is a separate window that can remain open alongside the main window, if you wish. It provides a visual representation of the movement of your mount and telescope relative to the pier. The dimensions of the telescope, dew sheild, focuser, camera and pier can all be edited (and saved for future use) to provide a fairly accurate graphic of your instrument. However, we do not recommend that you rely solely on this graphic as you move into tight positions near the pier. Nevertheless, this is a very useful (and fun) tool. Astro-Physics GTO mounts or OEM German Equatorial mounts with GTO Servo System (Parallax Instruments or Mathis Instruments), except for OEM equatorial fork mounts. All GTOCP4 Control Boxes or GTOCP3 Control Box with revision "V" or later firmware (Refer to information regarding firmware upgrade, if needed). APCC takes advantage of advanced features introduced in the “V" chip. APCC cannot be used with the earlier GTOCP1 or GTOCP2 control boxes. APCC cannot be used with any other mount. RAM is generally more critical to adequate performance than processing power. If budgeting for a computer system, spend the money on more RAM instead of the latest and fastest processors with the most cores. 8GB of RAM is probably adequate for an imaging system, but 16GB or more is even better. Solid State Drives (SSDs) have recently become much more affordable. They are certainly not a requirement, but are recommended for your boot drive for their robustness, lack of moving parts, and overall speed. At least 10GB of free drive space (for logs and settings) should be available. Native serial port, or installed PCI serial card, or USB/serial port converter required. For USB to serial converters, we recommend the following: units (sold by Astro-Physics), High quality units with FTDI chipsets (i.e. Industrial units from serialgear.com like their 2-port or 4-port), Industrial USB to Serial converters from Moxa, Converters from Digi/Edgeport. We CAN NOT advise using ANY converter with a Prolific chip set! AP V2 ASCOM Driver v5.20.09 or later We recommend installing the latest AP V2 driver before installing or upgrading APCC. APCC Standard (APCC-ST) - $249 ** FREE ** with new purchase of 1100GTO and 1600GTO.